Duration: appx. 6.75 hours at a comfortable walking pace; for those looking for a shorter hike, this is certainly doable as a half-day hike, we enjoyed taking our sweet time! 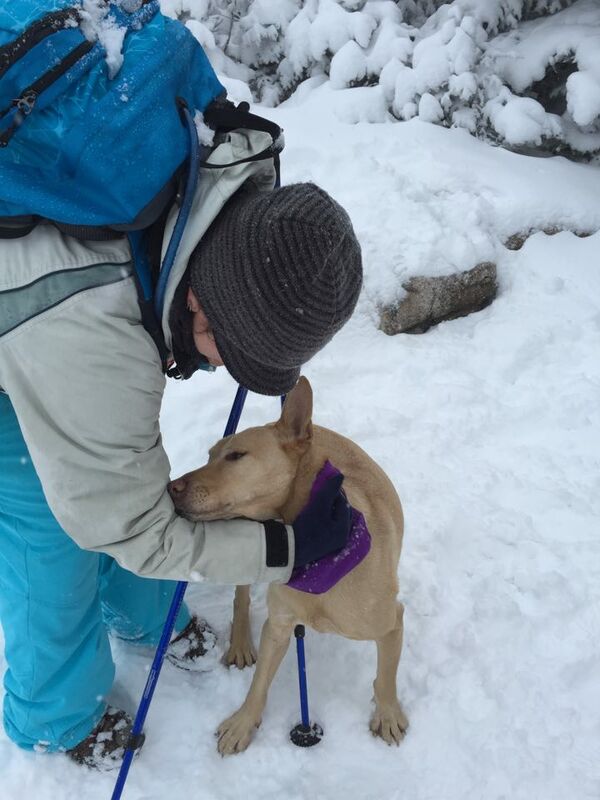 Saturday we had the pleasure of hiking with Vanessa and Jared with their dog Tank and Hannah with her pup Lilo. Driving conditions and traffic caused quite the delay on my end and we finally hit the trail at 10:15AM. The temp was right around freezing and stayed that way throughout the day. We even got an almost completely wind-free day in the clouds! While a long day, the trip report to follow will be uncharacteristically short for this tired, newly full-time career woman! 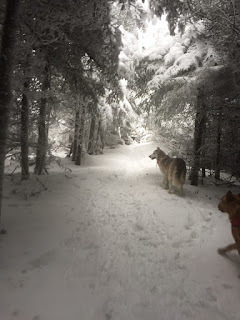 The snow was falling lightly and the dogs launched onto the trail like horses in a new pasture. The trail was gentle, wide, and straight, adding to the degree and ease of their frolicking. Within forty minutes, it had narrowed but still at an easy grade through snow-covered, empty trees. 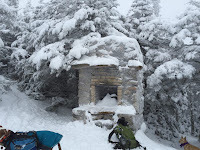 We slowing wound around a large blowdown and further up, only a handful of times even noticing there would be some boulders to step over along the way during the rest of the year. 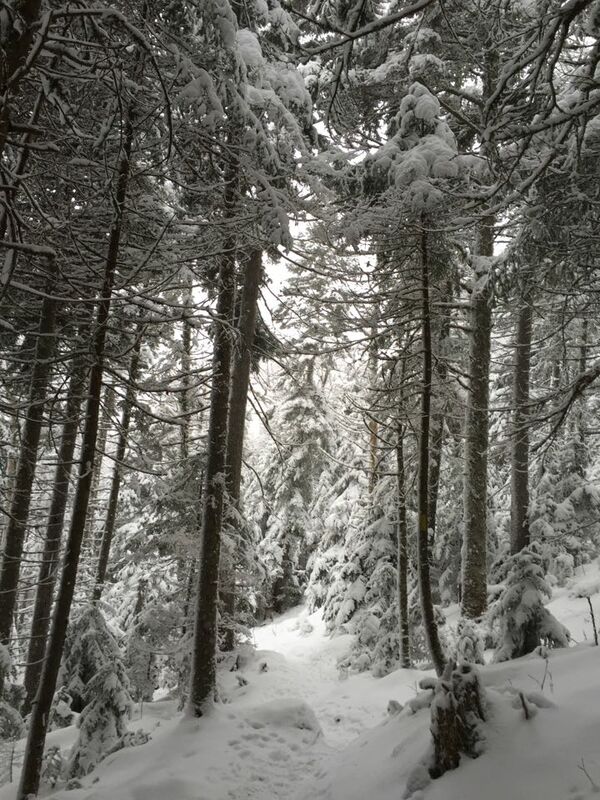 As the pines took over, the trail became a narrow path along a steep hill. To our delight, the trail's grade continued to remain gentle (are you noticing a pattern?!). Beneath the snow, the trail was a continuous sheet of ice. 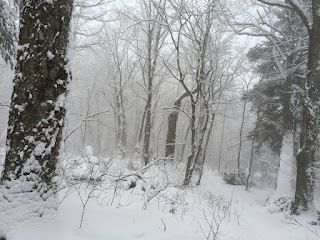 Most of us wore (light) traction for most of the ascent and total descent and the snow cover was sufficient to not affect us but my mind flashed ahead to the spring and I wondered how challenging it will be once that becomes exposed. Reaching Starr King took a little bit longer than expected but we definitely enjoyed the journey. We stopped for photos and the realization that I (thought) I lost my keys. 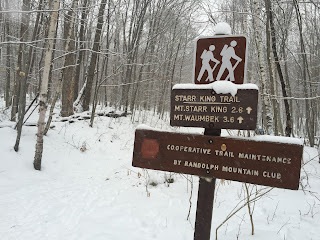 Between Starr King and Waumbek were some more ups & downs and twists & turns than I'd initially recalled but it was very enjoyable with the "warm" temps and winter wonderland atmosphere. The summit was marked by a cairn and small clearing (enough to gather for snacks). Hannah and I led the dogs past the summit by 50 yards to the viewpoint, of which there was not much on that particular day. We enjoyed some snacks, I argued with Ty, and we packed up to head down. Not much to tell about the descent except that it seemed to fly by. 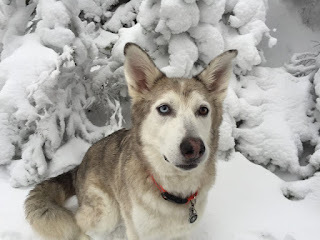 It took just over half the time it took to go up to the summit, even with my frequent stops to call out to and wait for Ty (we're going to take a hiking break to work on recall....). At times, it was very foggy and I believe Hannah was right, that we were hiking through a cloud - cool stuff! Back at the car, I found my keys (in it) and the dogs all piled in and promptly fell asleep, blind to the fact that there was still fun left to be had that day (we returned to Vanessa and Jared's hotel room to watch the game before departing). 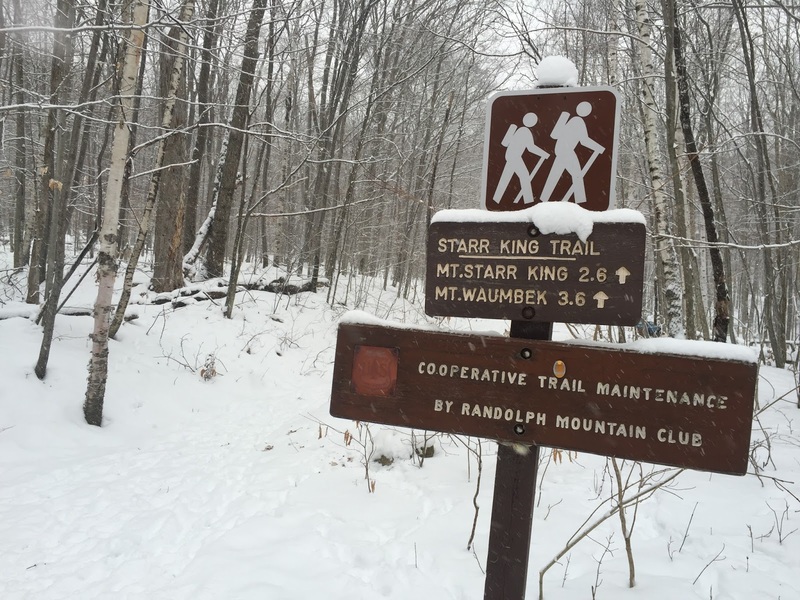 My primary reason for posting about our Waumbek trip is to add my two cents to the hundreds of dollars-worth of kudos for the Starr King Trail to its summit, especially in winter. The trail is fabulously gentle. As of Saturday, even with the light snowfall as we hiked, it is broken out and in great shape. 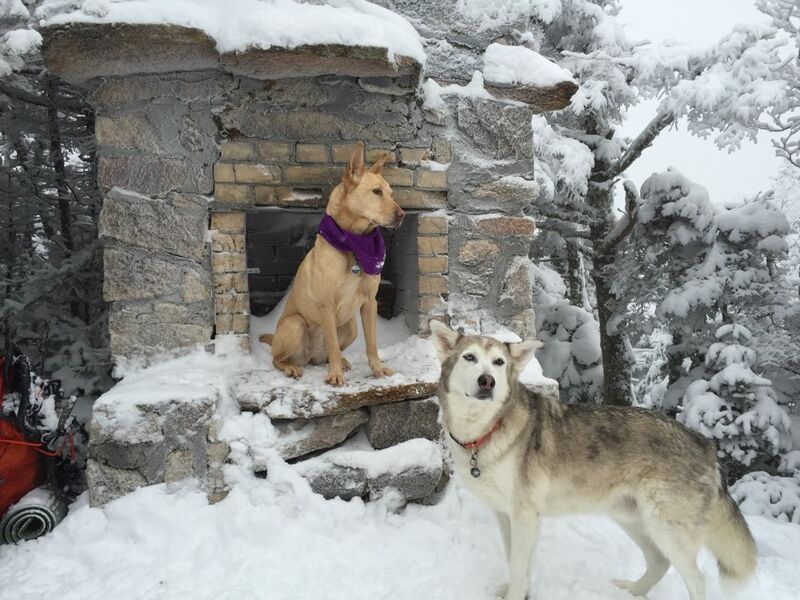 I used micros, though I saw every form of winter foot gear used, including bare boots. There are no water crossings although there is a small amount of dribble heading down towards the brook below near the start of the trail. There are, however, a lot more critters in them woods than most of the other hikes we do! Tons of deer tracks for example. One Gray Jay eyed us from Starr King but flitted away at the sight of 5 dogs milling about. Grade, wind-protection, potential for view, distance, and popularity (implication being "you're not alone") make this a great first or early winter 4K. One thing of note: from about .5 - .75 mile from the trailhead, we heard a large handful of gunshots. They were far from the trail but close enough to make me nervous about my bushwhacking dingo-dog who is afraid of the noise. Can't complain though, another winter 4K in the books, three very happy pups and one exhausted human grateful for amazing friends! For our first hike of 2016, we summited North and Middle Tripyramid on Sunday. 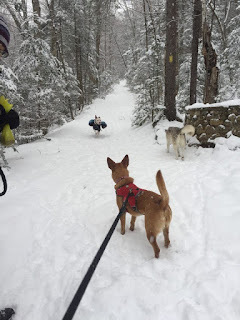 At 8:05 a.m., our group of 4 two-leggers and 3 dingo ladies* began our day at the Pine Bend Brook Trailhead. The skies were cloudy but the temperature remained at 30* for well into the morning. Pine Bend was a beautiful trail that began by meandering into the Sandwich Range Wilderness (at 2.2 mi) before increasing elevation. It included many easy rock crossings (one step) and had some icy mud to tiptoe around at the time were were there. 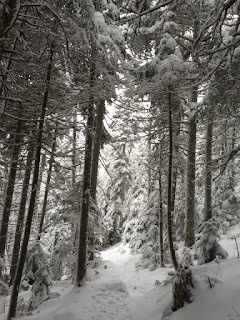 If memory serves me, there are steps leading out of the ravine when the climb truly started (snow covered on Sunday!). The next half mile or so offered both moderately steep and easy sections, all with the same even, packed snow underfoot. 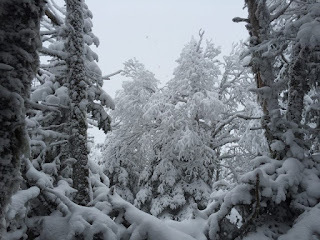 It was fun watching the snow pile on tree limbs more as the elevation rose. 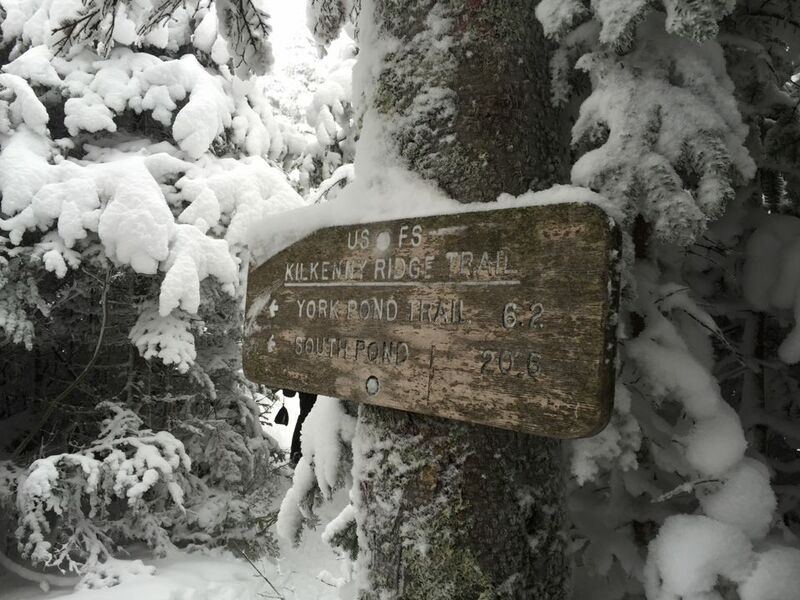 We reached the Scaur Ridge Trail junction around the same time we layered up. The wind was almost nonexistent (gratefully so because the forecast was unfavorable) but the temperature had dropped to around 15*. At first, the going was easy but soon we encountered short sections of steep, ledgy rocks. Several especially slick ones had her paths around them that we took advantage of. The going got easier and we reached Mt Tripyramid Trail junction. 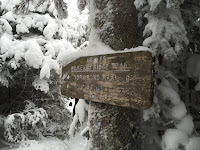 The first summit, the North Tri, was reached just moments after taking a left onto the Mt Tri trail. If we hadn't been there before, we would have kept on walking. There are some flat rocks perfect for sitting on a warmer, less snowy day but no visible indications we were at the summit. We followed some footprints to where we thought there might be a view (in spite of the clouds) but there was nothing. in the summertime three years ago to get a view! Middle Tri. It was an extra .3 miles (one way) and we moved quickly with the generally easier footing and moderate grade. There would have been some nice views at the summit and along the way if it weren't so cloudy. The openings still made for beautiful snapshots of the snow-draped trees. I dubbed these "waffle trees." The summit was abruptly on the left. Looking forward, it was initially unclear if the trail even continued; it would have required wedging oneself between two rock slabs and the one set of footprints that made it through quickly ended, indicating we were truly at the summit. The trail does continue on in a rough circle around all the Tri's but it appeared no one had taken the trip over to South Peak since the snow. I tried to make the girls pose for photos by the tiny summit cairn but only succeeded with little foster Eva. Departing the summit, Ty was unusually stressed and we got a bit ahead of the group for awhile til we reached the Sabbaday Brook Trail junction. 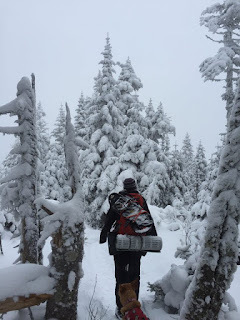 Our pro's and con's list for which way to head down had a very steep descent down Pine Bend or a longer but easier trail with wider water crossings down Sabbaday, which was obviously traveled since the majority of the snowfall but had a 1-2 inch dusting on top. We opted for the latter and I felt almost instant guilt as we descended relatively flat but steep rocks at an almost constant rate. 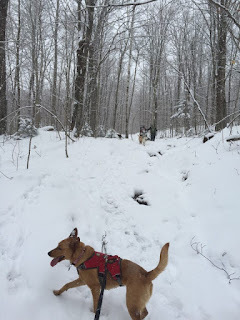 We did a lot of impromptu sliding on our back ends until it evened out and became the mellow trail I had remembered. While enjoyable, it was a longer journey than I recalled but Ty had started to perk up and be her natural, fearless leader self. There were some rock-hoppable crossings along the way with the trail often paralleling Sabbaday Brook. The sound of running water helped pass the time, as it was tough to hold a conversation with limited hearing due to my hat and Eva pulling me ahead. We eventually came upon "2.0" spray painted below a blaze. I've never seen a marker like that and at 1.25 miles from the parking lot, there was another. I found it odd that those were the two distances designated by the trail maintainer. The last mile was tougher than both steep sections (nearing North Tripyramid & the higher end of Sabbaday) combined - 3 sketchy crossings within a quarter mile. Still rock-hoppable but difficult, slippery, and wide. Most of us had a mishap. Even had to throw Ty and Eva from a rock to the side of the trail for one of them. (I strongly recommend investing in a trail harness like Ruffwear's Web Master) Shortly after the final crossing, I saw the signs and benches that indicated we had reached the falls. I wasn't as excited as I'd hoped since I had one damp (yet amazingly warm thanks to good socks) foot and an inability to unlock my phone for photos. The sightseeing was part of the allure of taking that trail down. Instead, we moved quickly to the parking lot, took off our micros, and briskly made the one mile walk back to the cars. The girls plopped down immediately, not even giving me a chance to undress them - the ultimate proof of a tiring hike! The loop over North and Middle Tri's is a challenging hike overall and I'm very glad we had great company. Pine Bend Brook is gradual, at most, until the last half mile. From the Scaur Ridge Trail junction to the summit are some brief, steep sections with herd paths around some of them. After that, the going is moderate and the terrain mostly smooth over to Middle Tri. Descending via Sabbaday Falls Trail was steep at first (appx. .4 miles) (but not boulder-y so we slid on our butts often) then a brisk four mile walk through the valley. The greatest challenge to take heed of are the water crossings. There are a number of small (easy) ones on both Pine Bend and Sabbaday but the latter includes three more challenging (and potentially dangerous in high water) crossings in the last mile. Thankfully, they're at the end, should slips occur! For a trail savvy dog with decent endurance and confidence, it's a great hike. 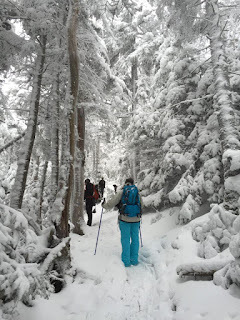 It was an especially important and significant one for me since I have become accustomed to easier hikes. Yet another day where I consciously passed on bringing poles then regretted it. Doable without but definitely easier with them! 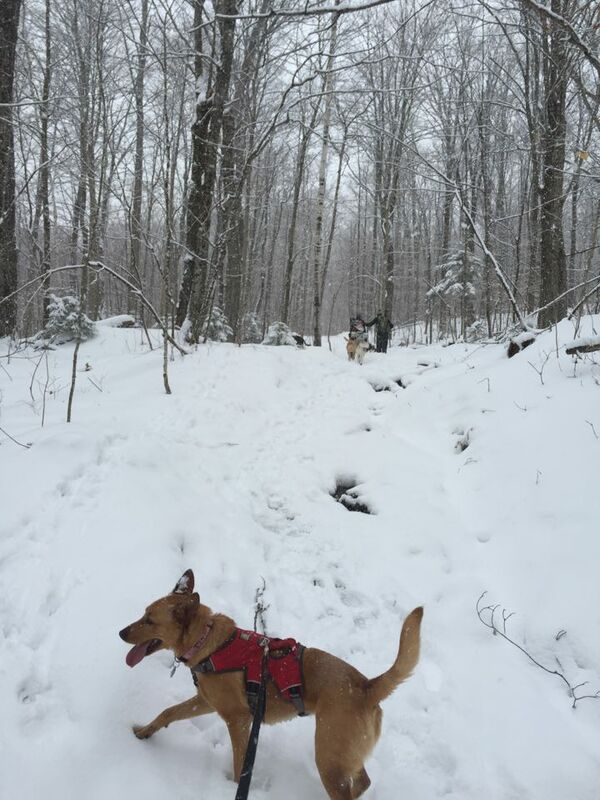 The trails are in excellent shape right now and all but one water crossing are not bridged by ice yet so there was plenty of drinking water for the dogs. One final note: Pine Bend Brook Trail begins on the roadside; they plow a little extra space on each side of the road for parking but there is no lot. 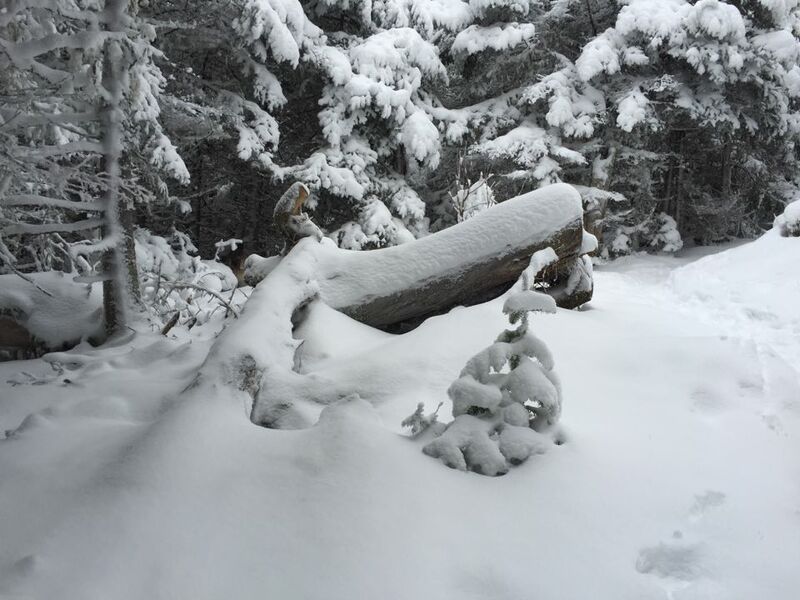 I'm very excited with the start of our 2016 winter hiking season!